Austerity is a horrible yet captivating story. As a narrative it’s cohesive, has strong emotional images and an active message – elements which clearly resonate with the public and lend legitimacy to government cuts. The left’s response, for all its logical and ethical weight, remains fragmentary, dry and largely reactive. We are, in the words of Mark Fisher, merely firefighting the effects of government cuts, always left on the back foot. To create a stronger alternative, we need to build a vibrant, cohesive narrative to carry those logical and ethical arguments. On December 30th 2013, The Daily Mail ran a front page story titled “Migrants will be Charged by NHS” which stated that “300 heavily pregnant women flew into Britain through one airport just to give birth in NHS hospitals”. Journalist Sophie Borland cited “Professor J Merion Thomas of the Royal Marsden Hospital” saying “the flow of West African Women flying in to give birth for free at Guy’s and St Thomas’ Hospital, in London, was so common it was referred to by staff as the ‘Lagos Shuttle’”. 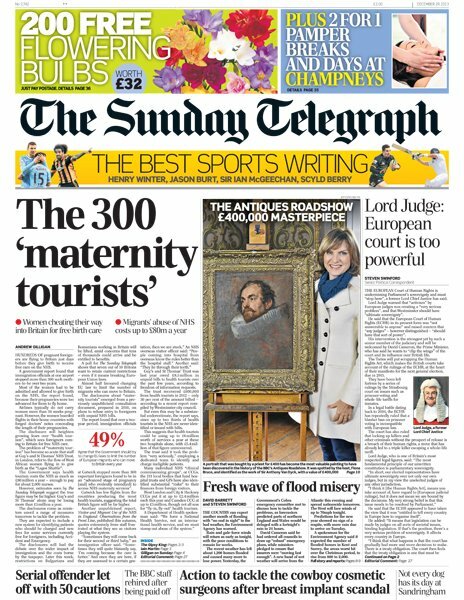 This story was a rehash of a piece by Andrew Gilligan in The Sunday Telegraph which revealed that the so-called evidence for these widely cited alarmist newspaper reports about “maternity tourists” was a “previously unpublished consultation document” from 2010, which laid out plans to refuse entry to foreigners with unpaid NHS bills. (A secondary source of evidence cited in these newspaper reports was qualitative research undertaken by a company called ‘Creative Research’ for the Department of Health in 2013). From Singapore to New Zealand, the imagined explosion of ‘birth-tourism’ has become a central feature of the mediation of an immigration invasion complex. 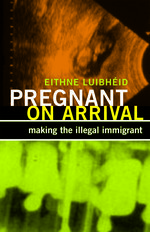 “Maternity tourism”, “citizenship tourism”, “anchor babies”, “passport babies”: This hysteria of naming intensifies beliefs about the ‘uncontrollable and debilitating “invasion” of migrants’ ’ (Genova, 2007: 434) and congeals in the figure of the conniving reproductive migrant intent on perverting citizenship and nationality norms (Lentin, 2004: 301). 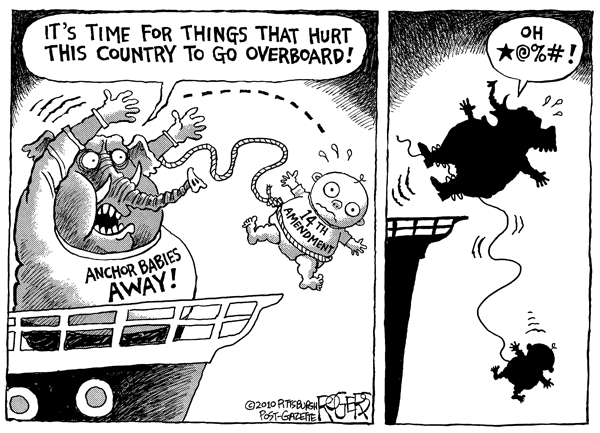 The alarm about birth-tourism is often pedalled in newspapers when politicians seek to grow popular opposition to jus soli (birth-right citizenship) provisions (and correlatively to convince citizen-publics to stomach the destitution, detention and deportation of migrant women and their children). Luibhéid has detailed the ways in which the Irish Government incited support for the abolition of the jus soli principle (the Irish Nationality and Citizenship Act of 2004) through a concerted press campaign in which migrant women where depicted as “childbearing against the state” (Luibhéid 2004). It is difficult to imagine a more naked borderline state than the act of giving birth. Yet increasingly birth is associated not only with the breaching of bodily borders but with the invasion of territorial borders. Migrant mothers even pose a terroristic threat as illustrated by an Irish newspaper headline in 2004 `State alert as pregnant asylum seekers aim for Ireland’ (in Luibhéid, 2004: 339). In Britain, the current round of news media hysteria about birth-tourism aims to generate acute fears about the erosion of NHS services—ironically in order to enable the dismantling of these services through their privatization. Indeed, the figure of the heavily pregnant African woman ‘lying through her teeth’ (to quote Gilligan) in order to give birth in Britain has become a staple of news media coverage about stretched NHS resources. There is evidence of small-scale but very deliberate abuse of the NHS. For example, a sampling exercise last year at one airport suggested that health tourists were being detected at the rate of about 15 per month. This primarily involved heavily pregnant women arriving in the UK with an intention of using NHS maternity services (Home Office, March 2007). In the case of a female passenger where the Immigration Officer has suspicions from her appearance, that she may be pregnant, the passenger will be asked if she is expecting a child and what her plans are for the birth. If the passenger claims not to be pregnant then the Immigration Officer may refer her to the port medical inspector, who will then examine the passenger and determine the approximate gestation of the pregnancy, if any. If the gestation of the pregnancy suggests that the passenger will be giving birth within the previously claimed period of stay […] then she may be refused leave to enter (Home Office 2008). These extraordinary ‘handling guidelines’ reveal how pregnant women first became a specific target of border control- in the absence of any empirical evidence that pregnant women where in fact travelling to the UK to give birth. Henceforth, suspected pregnancy is imagined in much the same way as smuggling drugs or carrying a weapon. Women are to be subjected to body searches to ascertain whether or not they are attempting to ‘smuggle’ unborn foreign nationals into Britain. As Eithne Luibhéid argues, ‘the pregnant bodies of non-national women provide particularly powerful loci through which the state both extends and legitimizes its exclusionary immigration practices’ (2006, p.74). The intensive focus on pregnant women at the border of Britain reveals how citizenship operates biopolitically as a means of managing the undesirable reproduction of non-citizens and thus protecting the ‘species life’ of the ‘native’ nation-state (see Agamben 2000). In Means Without An End: Notes on Politics (2000) the political philosopher Giorgio Agamben argues that, ‘“Nation-state” means a state which makes nativity or birth (that is, naked human life) the foundation of its sovereignty’ (20.1). As Agamben argues, there has been until fairly recently, a natural understanding of the relationship between birth-place and citizenship in which ‘the natives’ of any given place are also, by virtue of their birth, the rightful natural citizens of a territory or state. The fundamental idea of the sovereign state is based upon this myth that ‘generations reproducing within an almost unchanging territory in almost stable relationships for centuries have passed on an unchanging essence’ (Etienne Balibar in Buckel and Wissel, 2010, p.33). The trinities of ‘state-nation-territory’ and ‘citizen-nation-biological kinship’, which underpin mythic conceptions of sovereignty, are central to right-wing political rhetoric about ‘migrant invasions’. Migrant women represent a specific threat to nativist ideologies. The figure of the ‘reproductive migrant’ who threatens to populate ‘our country’ with ‘foreign children’ incites nativism, proliferates fears about both a loss of ancestry and the future of the nation-state itself. As Martha Escobar argues, ‘Ideal migrant labor is frequently defined as sojourner and exploitable, meaning that they migrate, labor for a while, and return to their home countries. The presence of migrant women disrupts this ideal since they represent reproduction and settlement’ (2008). The ‘crisis of sovereignty’ described by Agamben and others was affected by nation states themselves, as they sought from the early twentieth century onwards to manage and control their populations more rigorously and intimately. States began passing laws which variously sought to systematically denaturalise specific populations within the state through a scaling of citizenship. In Europe, hierarchal tiers of citizenship emerged and continue to be developed, which distinguish between those with full citizenship rights, those with partial or limited rights, those with limited leave to remain and those who have subcitizen or illegal status. As Agamben notes, ‘Such laws – and the mass statelessness resulting from them – marked a decisive turn in the life of the modern-nation state as well as its definitive emancipation from the naive notions of the citizen and a people’ (2000, 18.9). An increasing number of nation states have abolished (or have ‘scaled’) birth right citizenship (Jus soli) so that children who are born in nation-states to non-citizen parents are de facto stateless. For example, as I have previously detailed in the context of Britain, under the British Nationality Act 1981 children born in Britain to non-citizen mothers are not entitled to British citizenship (Tyler 2010, 2013). These children are in the extraordinary position of having entered Britain illegally at birth, and at birth become subject to Britain’s border controls, including detention within a rapidly expanding, privately owned, ‘for profit’ immigration prison estate. These children are the quintessential illustration of the break between nativity and nationality described by Agamben, for they are an indigenous population in all formal senses and yet they are denied the rights of citizenship. As Priscilla Huang argues (from the perspective of the USA) ‘immigrant women are particularly prone to ideological attacks, as well as punitive welfare and immigration policies, because of their capacity for child-bearing […] immigrant women’s bodies have become the economic, demographic, and political battleground for America’s future’ (Huang, 2008: 398). The bodies of non-citizen pregnant women and mothers have become ‘particularly powerful loci through which the state both extends and legitimizes its exclusionary immigration practices’ (Luibhéid 2006: 74). The ‘reproductive migrant’ who threatens to populate ‘our country’ with ‘foreign children’, contributes to a rising nativism by proliferating fears about loss of ancestry– a demise of ‘common-blood’ which it is imagined threatens the existence and future of the nation-state itself. In contemporary Britain—these fears are amplified by deep-seated concerns about the fragmentation and demise of the NHS. So whilst we imagine state borders as ‘being somewhere’, alarmist newspaper reports about floods of pregnant migrants pressing at British borders reveals borders to be a more complex network of relations (see Nyers 2008, pp.166-167). 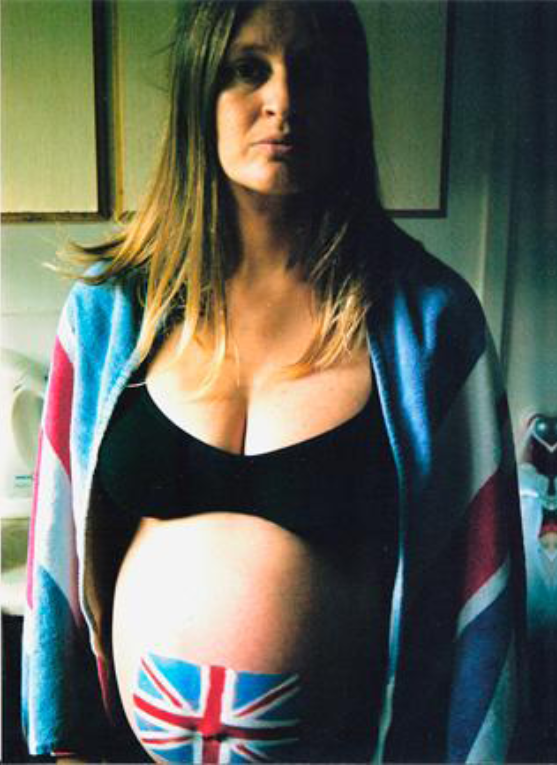 Increasingly maternity wards, and the bodies of pregnant women, have become the corporeal borders of the British State—scapegoated these women are not just symbolic but have become material sites of struggle about the future of the nation’s health. In the 2012 London Olympics Opening Ceremony director Danny Boyle and script-writer Frank Cottrell Boyce paid homage to Britain’s National Health Service (NHS) in a dazzlingly theatrical sequence of 800 dancing nurses –a vision which one US news commentator described as ‘a bizarre tribute to socialized medicine’ (Fund, 2012). Yet a few months before the Olympic Games began the The Health and Social Care Act (2012) had paved the way for the NHS, the last major edifice of the British post-War welfare state, to be eviscerated by private health care companies, pharmaceutical and insurance companies. For many British citizens the NHS is at the heart of what defines the British State. In order to effect the demolition of the NHS through privatization some very powerful scapegoating indeed is required.